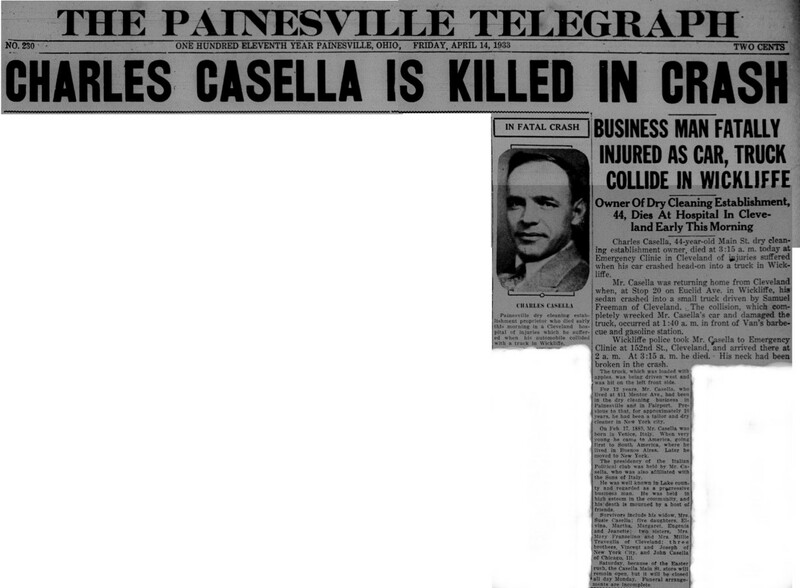 Charles Casella first appears in the Painesville, Ohio, area in 1921. Charles Casella, son of Salvatore Casella and Domenica Santi, was born on February 17, 1889, at Venice, Italy. He married Susi Ulrich, daughter of Joe and Catherine Ulrich, on May 21, 1910 at Cuyahoga County, Ohio. Charles died on April 14, 1933, at Emergency Clinic at East 152nd Street, Cleveland, Cuyahoga County, Ohio, at age 44, of a fractured skull, a result of an auto/truck accident at Stop 20, Euclid Avenue, Wickliffe, Ohio. His body was interred at Evergreen Cemetery at Painesville, Lake County, Ohio. Charles Casella immigrated to the United States in 1908. He was a tailor in Cleveland before moving to Painesville, Ohio. 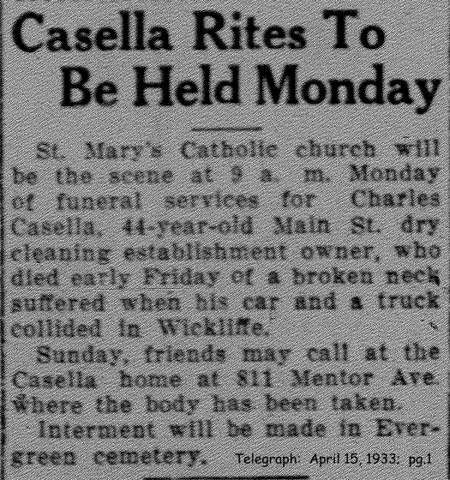 Mr. Casella owned a dry cleaning establishment on Main Street, Painesville. At the time of death, Charles resided at 811 Mentor Avenue, Painesville, Lake County, Ohio. Charles Casella’s name at birth is not known. 1. Elvina Casella was born in 1911, at Ohio. Elvina died in 1987. Her body was interred at Evergreen Cemetery at Painesville, Lake County, Ohio. 2. Margaret E. Casella was born on February 4, 1913, at Cleveland, Cuyahoga County, Ohio. She married Herbert A. Pomfrey. Margaret died on August 19, 2005, at Starkey Place, Painesville, Lake County, Ohio, at age 92. Her body was interred at Evergreen Cemetery at Painesville, Lake County, Ohio. 3. Martha Casella was born on February 4, 1913, at Ohio. She married Robert Kallay. Martha died in August, 1990, at age 77. Her body was interred at Riverside Cemetery at Painesville, Lake County, Ohio. 4. Eugenia A. Casella was born on December 6, 1916, at Cleveland, Cuyahoga County, Ohio. She married Maurice Champion. Eugenia died on June 14, 2007, at Perry, Lake County, Ohio, at age 90. Her body was interred at Perry Cemetery at Perry, Lake County, Ohio. 5. Jennette R. Casella was born on September 3, 1918, at Ohio. She married Jack R. Norris on October 2, 1940. Jeanette died on October 11, 1993, at age 75. Her body was interred at Mentor Cemetery at Mentor, Lake County, Ohio.